Also known as the Land of the Rising Sun Japan is both a very modern and traditionalist country where you can find bullet trains passing ancient temples and where besides being one of the most developed country in the world, many ancient customs are still in use . The country consists of over 6000 island of which four have Hokkaido, Honshu, Shikoku and Kyushu are the main ones, and it has very mountainous with many volcanoes of which the famous Mount Fuji is the highest. History is never far away in Japan. You can visit the historical city of Kyoto, well-preserved castles and centuries old temples, as well as Hiroshima, Nagasaki or Okinawa to get an idea of the destruction in the Second World War. Hokkaido, the second largest island, has beautiful natural scenery and parks. But you can find beautiful gardens throughout the country. The top three of Japan are Kairukuen (in Mito), Kenrokuen (Kanazawa) and Korakuen (Okayama), while the largest and most popular is actually the Ritsurin Park (Takamatsu). Climbing the 3776 meters high Mount Fiji is one of the more adventurous undertakings you can do while in Japan. Part of the huge Fuji-Hakone-Izu National Park the mountain is considered sacred so be sure to comply to local customs. Climbing season is only in July and August, while off-season climbing is possible, it is very dangerous and should not be done without extensive experience and alpine equipment. Some more easier attainable excitement can be experienced at one of the many theme parks, the Tokyo Disney Resort or the Fuji-Q Highland which is famous for its roller coasters. Japanese cuisine has conquered the world and most people already have tried Japanese food, sometimes without knowing it. The Japanese cuisine largest consists of white rice, soybeans and seafood. The seafood is not only fish but seaweed as well. Noodles are a popular alternative to rice and every major city has it own noodles dish. 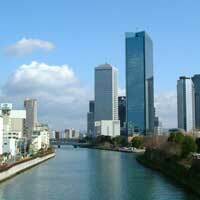 Use Utiket to find the best flights to Japan. Need place to stay in Japan? Look for more Cheap Flights to Japan.